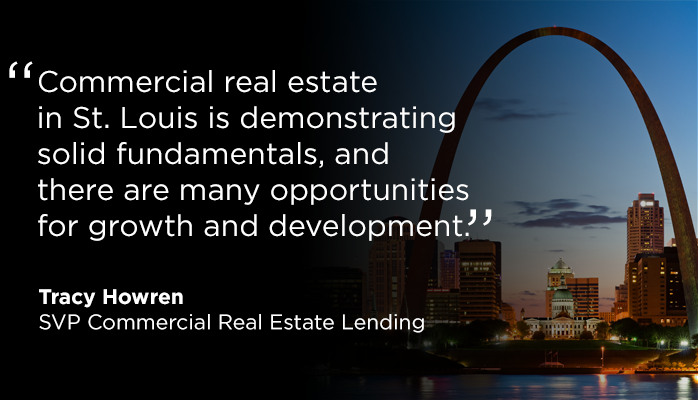 Tracy Howren, senior vice president, commercial real estate (CRE) lending at UMB Bank, recently sat down with the St. Louis Business Journal and other industry leaders to discuss trends in commercial real estate and offer an outlook for the rest of the year. Commercial real estate in St. Louis is demonstrating solid fundamentals, and there are many opportunities for growth and development. Several categories are experiencing growth, including industrial, multifamily, office and retail. The industrial market is red hot right now. With this sector in favor, our panel discussed how the market will continue to grow this year. Vacancy rates are very low and this, coupled with high demand, will result in continued growth and development in this sector over the next few years. In multifamily, there are some nice opportunities for development right now. Vacancy is up slightly given an elevated amount of supply coming online in certain areas, but I expect this will stabilize over the coming months. There is, however, still room for continued development in certain submarkets. As an example, the St. Charles area continues to perform well with low vacancy and increasing rents, even though more than 1,500 units have been built since 2012. For the office category, vacancy is generally down across the area. We are also seeing a shortage of high-quality space in some submarkets including Clayton and West St. Louis County, which I believe will result in new development in the coming years. Cranes‡ are in the air. We have several projects underway throughout town, including the new 5 Centene Facility in Clayton‡, and the new office tower at Ballpark Village‡, which is the first new office development in our downtown area in more than 30 years. There are several other areas around town that are being developed, from industrial properties along the I-70 corridor to new residential in the Central West End and Downtown. We also look forward to seeing the development of mixed-use space at Chesterfield Mall and Chesterfield Outlets. The success of these projects will drive additional growth to each neighborhood and spur additional developments down the road. It is an exciting time to be in the CRE market, as there are many projects underway and being developed across town. At UMB Bank, we are excited to work with the development community throughout St. Louis and we are excited to watch the skyline and area change for the better. From a UMB perspective, we are heavily invested in being part of the CRE market here in St. Louis. We’re continuing to grow our CRE portfolio, and we have a great deal of capacity and deep expertise in the space. With that capacity for growth, and our 105-year history in the Midwest, we’re looking to build long-term relationships that last through the ups and downs of all economic cycles and be a long-term player in the space. Read the full Table of experts: Commercial Real Estate‡ article for more details on St. Louis CRE. Tracy Howren is senior vice president, commercial real estate lending officer in UMB’s Commercial Real Estate division. Tracy is responsible for managing the commercial real estate portfolio in the St. Louis region, expanding business relationships in the area, and sourcing, underwriting and closing loans.